GSM network connection enables incoming and outgoing VoIP and GSM cellular calls. It is great alternate to PSTN, especially in area where GSM service is not available for VoIP call termination. GSM network connection provides significant advantages especially for calls from IP to GSM. In order to create connection between your VoIP network and the GSM network, there is need for a GSM Gateway. The GSM Gateway is an excellent device for VoIP to wireless service where PSTN is not available or for mobile phone roaming via the VoIP network. The GSM Gateway enables direct routing between VoIP network and GSM mobile network, therefore it makes it possible GSM voice calling and SMS messaging as well. 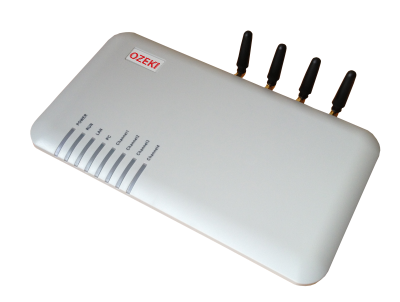 We highly recommend to use Ozeki VoIP GSM Gateway that provides multiple GSM channels. This device guarantees significant advantages for your business. Ozeki Phone System XE is a revolutionary software-based IP PBX for Windows. Due to its rich functionality, Ozeki Phone System XE increases the efficiency of your communication system. Discover the core benefits, like webphone, mobile extensions, SMS messaging and learn more about Ozeki Phone System XE.